According to Economic Times, Gujarat Urja Vikas Nigam Limited (GUVNL) (link) is planing to sign PPA's with solar project developers utilizing REC Mechanism. Various Project Developers are expected to sign MoU's with the REC Gujarat Energy Development Agency during the Vibrant Gujarat 2013 Global Investors' Meet during this week. The Process is also expected to start from next month. According to ET, the following are the major developers who are expected to sign MoU with REC Gujarat Energy Development Agency. Also Adani and Essar group are also expected to strengthen their footholds in Solar sector during the course of the event. Project Developers are expected to get an offer of Rs 2.64 per unit and also will be eligible for Trading their REC's. A lot of Project developers were waiting for signing PPA with Gujarat as GUVNL inked PPAs for less than 1,000 mw of capacity of the total of 3000 MW which was intended to be Commissioned.The Developers who were left out, will get a chance to even up their loss. 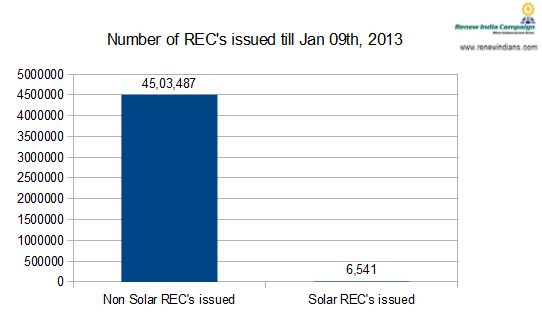 The Accute Shortage of Solar REC's is causing a big issue. 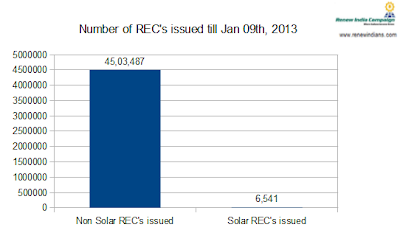 As of 9th Jan'13 - Only 6,541 Solar REC's were issued of the total of 45,03,487 REC issued. The Most of REC's Traded in India are Wind, followed by Bio Fuels and Bio Mass.